At Passanante’s Home Food Service we’re always looking for fabulous recipes to share with our customers. This week’s recipe comes to you fresh all the way from Italy! While celebrating 30 years of marriage at a beautiful villa in Italy, our close family friends were treated to the incredible authentic home-cookings of the villa’s chef, Andreanna. One of the recipes our friends haven’t stopped raving about is the “Authentic Italian Marinara Sauce.” This is recipe is fabulous over pasta, spaghetti squash, as a dip for fried or baked mozzarella — anytime you need “red sauce” we encourage you to try this out! Have a friend in mind that might like to try our home food delivery service? Check out our custom Facebook app to submit a request for a FREE food sample! 1 lg. (28 oz) can “Cento” Marzano Style whole tomatoes, remove center pulp by pinching where stem connected and gently pulling out, then gently shred tomato into pieces and drop into sauce. Toss center stringy pulp out; add remaining liquid from can to sauce. * Pre-cut and packaged basil lasts way longer than basil still on the root. Snip the already cut end and place in a short glass; cover with a large Ziploc bag and seal to edges of glass. Leave on counter top, and it will last almost two weeks — refrigeration usually turns the leaves black. Add crushed tomatoes, about 1/4 cup water, basil and chicken bouillon. Give one good stir; cover and continue to simmer 20 minutes. 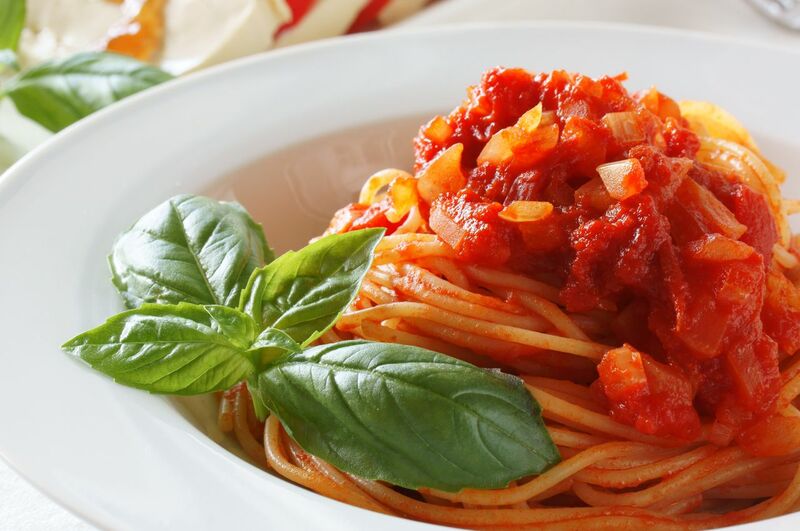 Serve “Authentic Italian Marinara Sauce” over fresh pasta (or spaghetti squash) with tomato/mozzarella/basil salad (Ensalada Caprice) and garlic bread if you like. Add some fresh basil, and count to three while pouring olive oil and balsamic vinegar over the top. Put the about the same amount of cubed buffalo mozzarella as cherry tomatoes on top, cover and chill till ready to serve. Don’t forget to pair this meal with a great red wine! A good chianti doesn’t have to be expensive and always tasty with Italian food. This entry was posted in Recipes, Sides & Salads and tagged ensalada caprice, Food Delivery Service, FREE Sample, marinara sauce, Passanante's Home Food Service, Recipe by Passanante's Home Food Service. Bookmark the permalink.